Frustration, anger, disappointment, unenjoyable, over far too quickly .. Despite losing my first 4 games, I made it to the 6 wins for Silver 2 quicker than I expected, so decided to play a couple of games late Sunday with an "experimental" team for Rivals points. The first game he rage quit at 2-0 down in the first half, the second he scored an OG immediately at kick off, and then quit. It's the taking part that matters, not the winning. 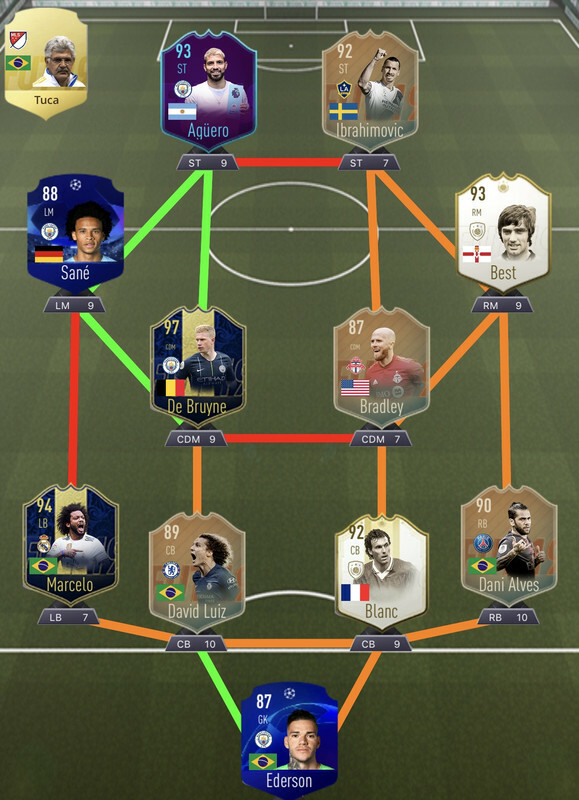 I'd brought in 93 MVB for 92 Lineker ready for this WL, and was excited to see how he got on. Unfortunately, me and Marco just didn't hit it off. He scored only 4 goals in 14 WL games - whereas Gary had got 108 from 118 games (with essentially the same team around him). So I'm on the hunt for another striker. I've heard good things about 92 Stoichkov, so will dig down the back of the sofa for some extra coins to try him out. But he's got M/M, and only 3* WF (which I find severely limiting in a Striker), so I'm nervous I'll only be disappointed. I don't think Butra, Del Piero or Zola will work, as I need someone more physical (I tried Butra after I packed him last Sunday, and unfortunately he just didn't suit my play style at all). I've heard good things about that Carnibal Jesus, could be worth a shot. I was going to suggest Butra until I read the rest of your post - came up against him a couple times this WL and he destroyed me. Going to do a big shake up in my squad I think, been using the same team for a while and the same formation for about 3 years! Been reading the 352 guide on here and think I will give it a go. Have been guilty of using drop back so something a bit more crazy and attacking should be fun. Going to complete three big SBCs to form the base of the side. Desailly (even though I said he was a bit meh), De Rossi and finish up La Liga for Umtiti. Hoping for some big pulls from Desailly and rewards (lol) to help with the funding! Another weekend league is upon us. Sold up abit of my team and went with some untradables. I’m glad I sold and raised quite abit of coins as prices are tanking in anticipation of FUT Birthday. Hope you guys are just as liquid. As we approach the business end of the season I hope u all still have the hunger and desire for one final push for glory. Been getting G3 pretty consistently since Nov but always seem to agonisingly fall short of making the big leap to G2....I’m a forever optimist....knowing my luck I will get it this weekend with the TOTW bound to be poor as it’s International week. Done with another weekend of WL. Somehow I managed to hit 15-9. Got lazy on the Sunday night as I had to play a few games of SB to get the last SWAP player. I managed to squeeze it Stranger Things season 1 plus my wife was happy with my time spent with her and baby. I must congratulate myself a good weekend! I started off badly. First game I was up 3-0 at HT. I wanted to broadcast my WL on YouTube at the HT break. I ended up getting DC as I was at the PS option screen for > 10 secs. (I didn’t know that at all). Second game I lost on PK. My fault as I didn’t play till the final whistle. Was comfortably leading 4-2 till 88th min and subbed out KDB IBRAH and Bradley earlier to give a run out to some players. Suddenly the usual BS happened. Passes going to a diff direction and opponents scores with simple cross then header type of goals. The final score was 6-6 and opponent just kept scoring last min momentum goals and kick off goals. New lesson. It ain’t over till it’s over. The rest of the games were pretty routine. Nothing special and out of the ordinary. KDB had a miserable WL by his high standards from the last one. Ibrah had his first WL as a starter after being on the bench this whole Fifa. Abit of nerves as he had a 4 game drought. Prime Figo did well with some goals. But I sold him thankfully as his price tanked after PIM Figo came out. I again ended up inG2, this time with 2 games to spare. started quite bad, with 3-2 and went into a spree to 10-4. After that I pretty consitently did a 1w, 1l . My Ibra just cant stop scoring, and DdR is a tank in the CDM spot. I started noticing now that my De Jong was holding me back a little on the cdm, he just didnt win enough duels, so ill vut him (and therefor also De Ligt and Taglia) for the next WL and see what happens. Replacements will be 90 VvD, 88 (EL) Alonse and Kante. I also switched Cancelo for the FS Calabria to get on Full chem (Cancelo was at 8 and so was Luiz). Most intersting switch I did was, when playing in a 4231, put Butra as the LCAM and Nedved as CCAM. Butra is very good from that spot, and I like Nedved better in a central position. All in all, gameplay was pretty good this weekend, cant complain about the result. Will try to push into G1 again next week I think! How are we all doing - still have finger-nails, hair, controllers, partners...? Another Silver 2 finish for me - just didn't have the time to push on for Silver 1. I used Ultimate Bergkamp on loan for a few games, as was very keen to do his SBC. He scored a couple of great goals out of nowhere, but it wasn't the amazing card I'd hoped it would be. @EricVanDerek I found PIMP Socrates to be really good. You can consider him. 2) He’s likely to use up most of my coins. I’ve done Socrates’ loan, so will try him out in both positions. I just need to be patient before doing any Icon SBCs, as there will be more sickens and FBs to come this week. Unfortunately much harder said than done for me....! I played the 89 Socra on both CAM and Str. He is good in both positions, although I prefered (much) as a CAM. For striker, I felt like he missed something (dont know what , my other striker is Ibra). I now play with a partnership of Butragueno and Ibra, and I prefer the small agile man with the big guy. But, if you need a CAM, you can not go wrong with Socra. He is a beast. Had a great start this WL and went 11-3 on Saturday! I feel like my team is very solid even since PIM Cannavaro joined my team and PIM Baggio provides the consistent firepower that my team needs. But just like the last 2+ WLs, I can't seem to win on Sunday. Game 29: I had like 60% possession in the game, led by 2-1 until the 85th minute where AI gave a penalty and I didn't even hit a button. I saved that penalty kick and scored from counter attack right away. After I regained possession my opponent got a red card from slide tackle from behind and he raged quit. Game 30: Took the lead around the 20 minute. But in this game whenever I scored my opponent's Lukaku (NIF) would response right away. By the 50th minute the game was tied at 3-3 and his Lukaku already had a hat-trick. I regained my lead again around the 60-ish minutes, and then out of the blue my opponent quit the game at 70th minute. (WL still had 5 minutes to go in real live at that point, maybe he wanted to start a new game...) Anyway, free win is always welcome. Saving up coins now and hope I can pull something nice from the reward packs. I have a strong feeling that PIM Maldini SBC will come out in this promo. Started 9-6. Finished 3-12. I was expecting to make G2 and I didn't even make G3. After my first half, I got matched up exclusively with super players with super teams. Every single one must have been G1 or Elite. A Fi-familiar story.....G3 again. Gave away my last game as a free win. My opponent messaged me to say thanks and that it was his last game and needed the win for G3. (I was winning 2-1 and I scored 2 OG’d in the last minute)....makes it all worthwhile. Thoroughly enjoyed the weekly objectives and managed to acquire the 3 Birthday cards that were available....Ibra and Naldo promptly went into the Blanc SBC...I enjoyed playing with an average team. Hope u guys had successful WL. PS...a wee tip. ...there is umpteen icon SBC’s. the rising talent one (a team of silver rare players) can be done for between 4 and 5k....u get a Gold players pack...(1 rare)...even at discard value u would get around 4k....anything sellable is profit....I’ve done them and must be up around 60k from them. It’s a cant lose situation. Good tip. The bronze one is also very good as you get a silver players pack which can have a lot of expensive players. I hope I can play WL this time around. Concentrated on Rivals last weekend when I had the time and made it to division 4. Then came the quickest relegation of all time, lost every game and quickly found myself back in Div 5. That ended my flirtation with 352 and I'm back with 4231, this time with a much more attacking outlook that I'm enjoying. Good luck everyone for this week’s WL. Rolling with this team this weekend. Debuts to Blanc & Best. holy F, that is an incredible team.... you must finish gold 1 most weeks i’d imagine? I tried WL again this week and its solidified my decision: I'm quitting FUT once 19 ends. This game is a disease, just like the company that made it. No positives whatsoever and its sole purpose is just to make more and more money every week. These developers clearly have no pride in their work and instead of constantly improving their game they're more preoccupied with treating us like human ATM'S. I've been playing FIFA for 20 years now and I cant continue. I genuinely hate this game and hate how it makes me feel every game. It's just not healthy and I wish everyone had the courage to out this game in the trash where it belongs instead of enabling their respective sunk cost fallacy. Hope you guys had a good WL? Seems like not many of us regulars here play much? Ended up with 19 wins again. I swore I was so confident and thinking this could be the weekend where I hit GOLD 1. I was at 14-4 at one point. Eventually I did hit 17-7. Lo and behold, after that I struggled. I was struggling from the 20-28 game where even when I won, it was such a laboured win. Best had a decent WL with probably some nerves setting in. There were some inconsistent moments where his ratings were in 6.8-7.5 for a few games. He should get better when I get used to him. Next week WL will have some signings to hopefully nudge me to gold 1. I haven't been able to play in a while and not sure when I will again. My housemate annoyingly has stopped going home at weekends so WL is unplayable. Pity as I have been enjoying FIFA recently in Rivals. It’s time to get him a girlfriend or something!! Finished this WL with a 16-14 record. Got my 16th win after game 28 but lost game 29 in over time and lost game 30 from a 120th minute goal. Can anyone just clarify how late you can redeem WL entry now please? I might be able to play on Saturday but won't know till Friday evening. Had my best WL as i finished 14-6. Was thinking of playing all games but didn't have time.